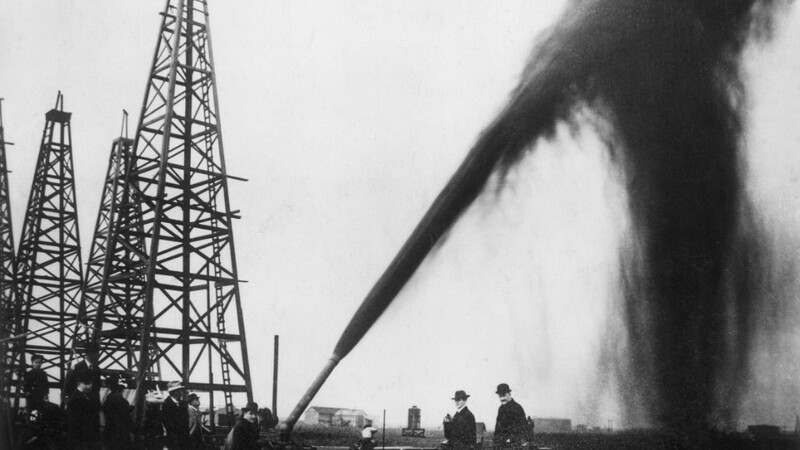 The U.S. is beginning to step up its oil exporting game. The 40-year ban on exporting U.S. crude was lifted last December. Since then, there's been a sevenfold increase in America's oil exports to destinations other than Canada, which was excluded from the ban. The frenzy of export activity, while still relatively small, is noteworthy given the depressed environment in the oil patch these days. Not only is the U.S. pumping less oil, but there remains a lingering glut of oil around that world that earlier this year caused crude to crash to 13-year lows. "Exports should pick up. The reason we're not surging now is the world is still oversupplied with crude," said Anthony Starkey, energy analysis manager at Platts Analytics. Yet U.S. oil exports hit an important milestone in March, the latest month that statistics are available for. For the first time since 2000, the majority of U.S. crude exports were to destinations other than Canada, according to JBC Energy. Related: Saudi Arabia says $60 oil is coming. Soon. 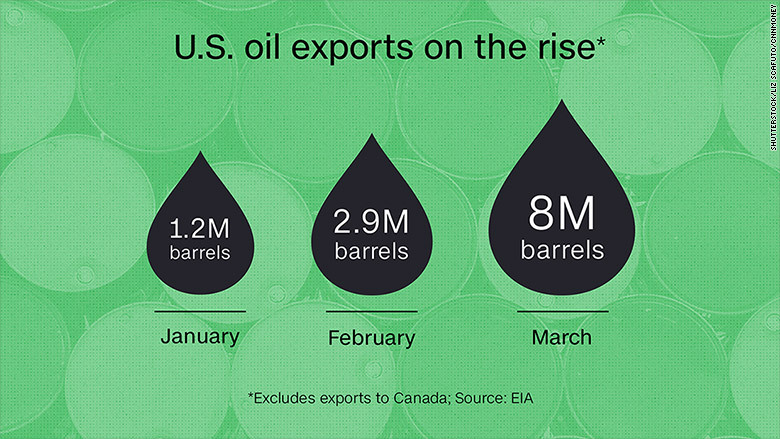 The U.S. exported 15.7 million barrels of oil in March, with only 7.7 million of those barrels going to Canada. Japan and Italy were the biggest buyers, importing more than 1 million barrels of American crude apiece. Interestingly, the U.S. also exported an average of 75,000 barrels per day to the tiny Caribbean island nation of Curacao, which is located just north of Venezuela. That's up from just 17,000 barrels a day in February. Starkey believes that's a sign of likely demand from Venezuela, the troubled South American country that owns a terminal on Curacao. Venezuela's oil wells yield a heavy crude, which needs to be blended with lighter blends found in the U.S. and elsewhere. It's not the first time Venezuela has looked to the U.S. for oil. The country imported half a million barrels of oil from the U.S. in February as well. "Now with the U.S. able to export ... they can source their needs closer to home and at a lower cost," said Starkey. Interestingly, in March, the U.S. also exported 49,000 barrels per day to the Marshall Islands after not having sent any crude to the Pacific island chain earlier this year. It's not clear what sparked the imports, but the U.S. military has a missile defense test facility on several Marshall Islands and the nation relies on direct U.S. aid for the vast majority of its budget. All told, the U.S. exported 508,000 barrels per day in March. That's not a ton considering America imported 8 million barrels of crude oil per day in March. But it's also not an insignificant sum, making up almost 6% of total U.S. production that month. Many in the industry hope oil exports will play a bigger role in the future, providing a new market for all the shale oil being pumped. "We're ready. When prices go up, U.S. crude is going to be more in demand," said John LaRue, executive director for the Port of Corpus Christi in Texas. On New Year's Eve, the Port of Corpus Christi was the first to export U.S. crude oil sold by ConocoPhillips (COP) to international trading company Vitol in Europe. But Starkey said no huge increase in export activity is likely until U.S. production rebounds following a recent decline from the April 2015 peak. Another factor at play: The U.S. is flanked by two huge oceans on either side, so the oil generally has longer distances to travel. U.S. crude, known as WTI, is trading at around the same level as the global benchmark Brent crude. As of Monday, there is just a $1 difference between these two closely-watched oil contracts. That means WTI isn't trading at a big enough discount to justify the extra shipping costs involved with shipping U.S. crude long distances. "It's not all that economical to send this stuff anywhere," said Starkey.